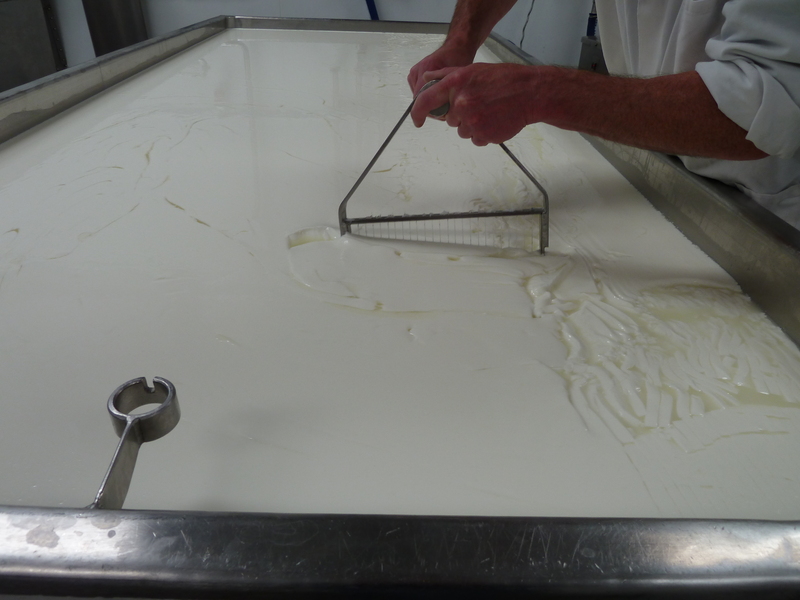 Today, we made the largest amount of cheese in one vat – ever! Will we get 1,900 litres in? 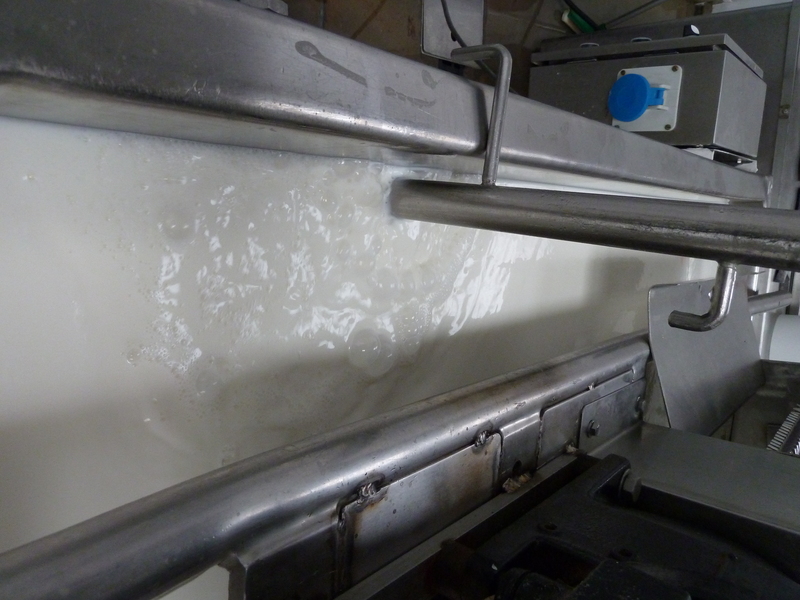 Somehow, we managed to pasteurise 1,900 litres of goat milk into our large vat which had about two inches to spare to the top at one end and less the other end by the outlet valve, as the vat is on a slope. Stirring it was fun, let alone cutting and shovelling it. Still, we had had limbered up, with last Friday’s sheep make still lingering in our muscles. 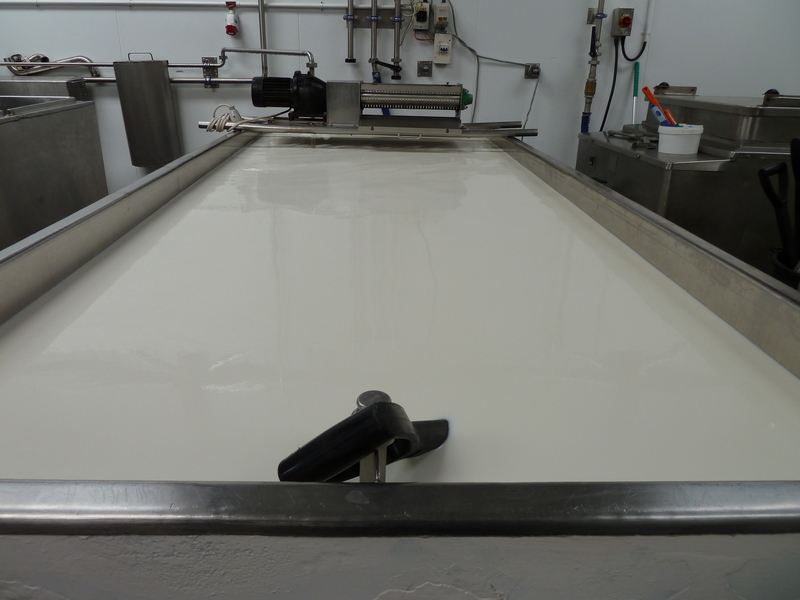 Because of the high yield of sheep’s milk, 1,900 litres in one vat would just not be possible because it would be too much for two people to shovel. 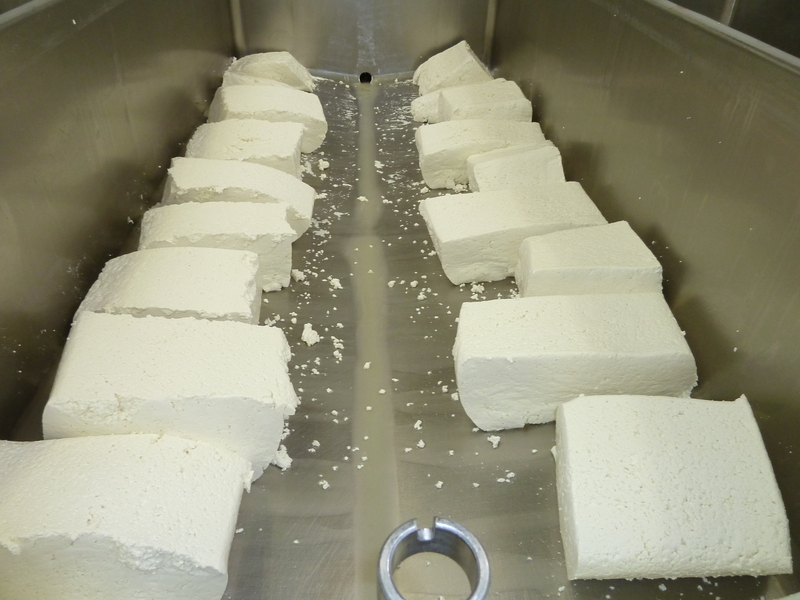 When we make sheep’s cheese, we split 1,500 litres and 500 litres in the big and small vat respectively. Even 1,500 litres is a tremendous amount to shovel. 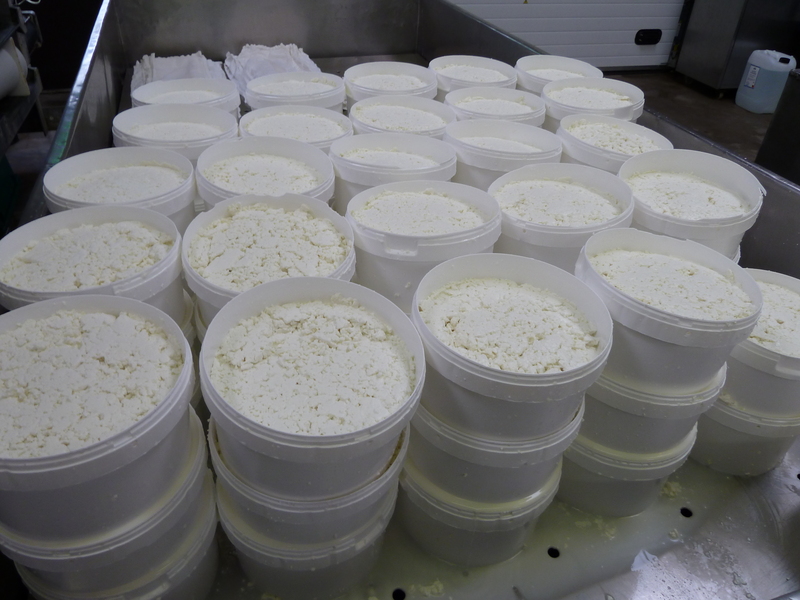 Our 1,900 litres translated into 72 pots, each weighing between 2 – 2.3kgs, so about 150 kgs in total. Which puts it into perspective – me and Stu have been shovelling 150kgs between us. 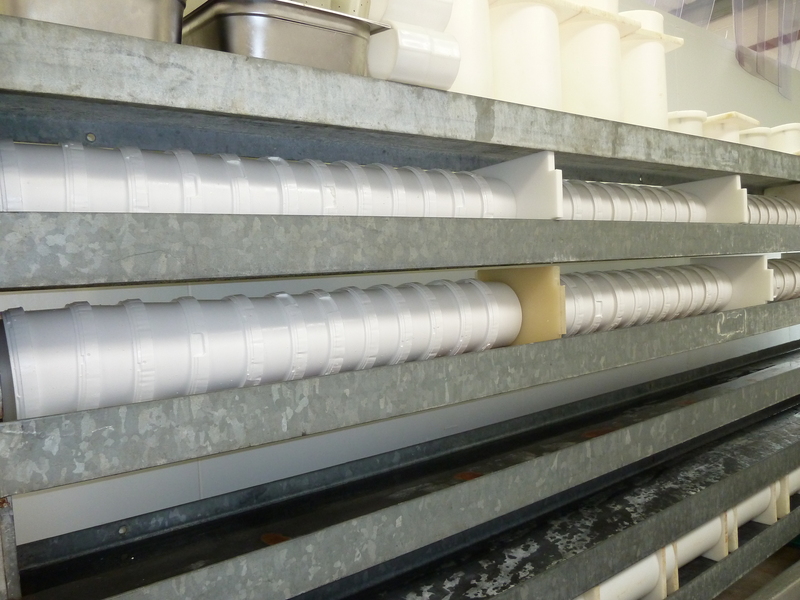 before we salted an milled. It was FAST! But a good make. Steve, our Parcelforce chap dropped by just after we had milled and were potting up. We gave him a small amount of curd to try and he really liked it. I think it will be a good make! Nice and crumbly, Original Goat, batch J12. Phew - clothed and in the press! Looks absolutely fantastic – well done and hope you both had a good massage afterwards – you earned it! Wish I was there to have a taste and to help. HI Sally, am still at work, still checking that the press isn’t misbehaving. But could really do with that massage; we were just talking about having a masseur after big cheese makes! Especially sheep makes! Am sitting in the office/restroom, listening to the whey dripping and buying stuff in preparation for our trip to Nantwich: got to find some money boxes/money belts, some cocktail sticks and some acrylic dispay cards for us to put descriptions of our cheese and chutneys. Is Wendy still driving over to you in August? If I got my act together, could send some down for you and her and if you didn’t mind, for my father as I promised him some for Christmas and his birthday and have spectacularly failed on both counts – he is expecting a double shipment! Hope all is well with you. Don’t want to hear how hot it is!